If speed is aviation’s ultimate excess, altitude is its great equalizer. Fly high enough, and the sky washes the Earth clean of the soiled hand of man, hiding the blemishes inflicted in the short span of a few hundred years. Even if you’re flying in the bottom two miles of sky, altitude helps smooth out the wrinkles, softening the hard lines of age, leaving the land looking more peaceful and unspoiled. Twenty-seven thousand feet is a good compromise, more than enough but less than too much, especially if you happen to be cruising effortlessly above Northern Spain in a Piper Cheyenne III propjet. From five miles high in skies as clear as Chablis, you can see forever, or at least the land that helped spawn 2,500 years of recorded history, which is close enough. This is most legitimately the Olde Country, though it’s hard to tell from the high road. Take away cities and highways, and the Earth seems pristine and unspoiled, countries without borders, meadows without fences, rivers without bridges, highways without traffic. Directly below is the magnificent Basque Coast, beautiful but rugged geography rising straight out of the angry Atlantic, like Northern California with a Spanish accent. Somewhere down there, in fact, practically everywhere down there, thousands of pampered sheep graze the lush, placid hillsides of Asturias Province, unaware of my presence as I pass silently above them in the soft yellow light of dawn. Just over the horizon, beneath the quiet radiance of the new sun, France awakens to the early-morning vineyard mists of fall. In Bordeaux, Pau, Toulouse and Perpignan, farmers prepare for yet another day of harvesting the grapes that produce arguably the world’s finest wines (unless you’re from California). Since long before airplanes blotted the skies over Europe, bringing first bombs and later tourists (perhaps the greater threat), the land itself has represented the eternal truth, the source of life for millions of people who understand plows, spades and hoes, but haven’t the slightest interest in Mach numbers, compressor rpm or turbine inlet temperatures. To them, the sky above seems endless and incomprehensible, but a farmer knows his 50 hectares of grapes or figs or olives or lemons will provide his living and feed his family. Corporate travel by turbine power may be something of an ultimate norm for a lucky few pilots and their affluent clients, but the true people of the Earth, those who live by the land, will never know what they’re missing and probably could care less. The sky is equally blasé about such technical accomplishments, but today it’s also uncharacteristically cooperative, I muse, marveling at the visibility, watching the pointed white peaks of the Pyrenees materialize like armored knights in the distance. The mountains reach up for me, jealous of my artificial, man-made altitude, but fortunately, even their loftiest summits fall three miles short. On the panel in front of me, I’m suitably impressed by the engineering that allows me to fly so high and fast and delivers me from evil. The DME and GPS argue the academic as to whether I’m traversing Spain at 298 or 302 knots, and I wonder at all that passes below unnoticed in my haste. It seems somehow disrespectful that I should overfly so much beauty and tradition at five miles a minute. In a sense, the Cheyenne is my time machine, transporting me across the centuries, as well as the continent. But time and business wait for no man, least of all a corporate pilot in a $2.0 million turboprop. I’ve been hired to help drive one of Piper’s ultimate turbine twins around Europe for three weeks. Today, I’m filed from Aviles to Barcelona, little more than a brief morning interval in the big Cheyenne. I hurry southeast in the grip of an unseasonal high, shunted along by 30-knot winds, floating on a column of sky as soft and smooth as an air mattress, which in fact, it is. For those lucky enough to fly Spain, there are few ways more comfortable than in Piper’s big turbine, a luxurious traveling machine capable of transporting up to 11 people across continents at nearly 300 knots. A logical, stretched successor to the Cheyenne I, II and IIXL, the III was created with more cabin, more seats and more power to lift it all. 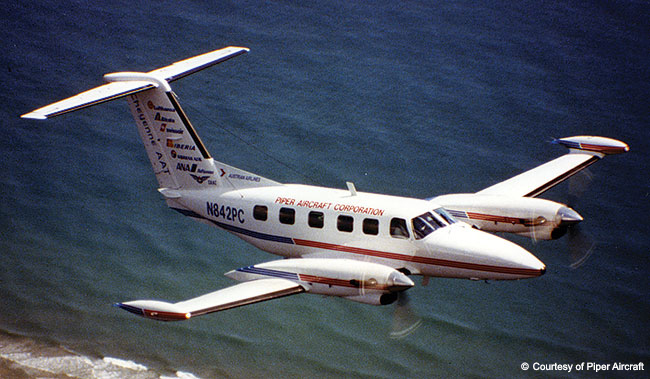 Engines are the seemingly bulletproof P&W PT6A-41s, rated for 720 shaft horsepower each and able to range a spectacular 1,700 nm if there’s a need to reach out and touch far horizons. Traveling Europe by any private aircraft isn’t nearly as tough as most pilots believe. It’s an aeronautical sightseer’s paradise, and Spain offers some of the best flying to be found on the Continent. The people are friendly, the food is generally excellent and the climate is good, especially south of Madrid where the atmospherics are closer to desert Casablanca than rainy Paris. Still, many pilots have heard stories of terribly complex ATC procedures, universally rotten weather, perplexing language problems, high landing and parking fees and a variety of other difficulties associated with operating in Europe. No question, some of those stories are true. Logic doesn’t always prevail in Europe any more than it does here in the U.S., but most stories are anecdotal exaggerations.